Everybody likes to win – even if what you’re competing for isn’t necessarily something you want. With that in mind, we are excited to announce the Toy Sale Boat “Win What You Want” Giveaway. Today - and every weekday in March – we will be revealing a new toy that at least two winners will be able to pick from. You may enter once per post, which means by the end of the month, you could have a maximum of 20 entries. One grand prize winner will be randomly selected from all valid entries and will be given the opportunity to choose from the 20 toys revealed throughout the entire month. A second winner will also be chosen and may select from the 19 remaining toys. If the Toy Sale Boat Facebook page reaches 500 Likes by March 31, a third winner will also be chosen. 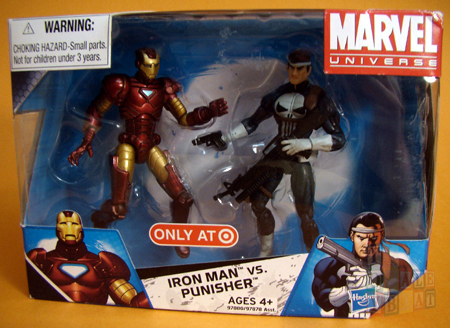 Our fourteenth reveal in the "Win What You Want" Giveaway is the Target Exclusive Iron Man Vs. Punisher Marvel Universe 2-pack from Hasbro. The phrase of the day for Thursday, March 22 is "You know, the question I get asked most often is, 'Tony, how do you go to the bathroom in the suit?'" Post that phrase exactly as it appears here as a comment to this Facebook post and your entry is complete for today.